Tim Duncan, Manu Ginobili and Tony Parker, the winningest trio in NBA postseason history, shared hugs. Players wrapped themselves in flags from around world, a reminder that the San Antonio Spurs look far beyond the border to build champions, as confetti fell from above. Painfully denied 12 months ago by the Miami Heat, this victory party was worth the wait. "It makes last year OK," Duncan said. The Spurs finished off a dominant run to their fifth NBA championship Sunday night, ending the Heat’s two-year title reign with a 104-87 victory that wrapped up the series in five games. "We had a great first quarter, but from that point on they were the better team, and that’s why they’re the champions in 2014," said LeBron James, who led the Heat with 31 points and 10 rebounds. San Antonio erased an early 16-point deficit and routed Miami for the fourth time in the series, denying the Heat’s quest for a third straight championship. A year after the Spurs suffered their only loss in six finals appearances — a heartbreaking seven-game defeat — they turned the rematch into no match at all. "We wanted to redeem ourselves. I’m just glad we were able to do that," Parker said. Finals MVP Kawhi Leonard had 22 points and 10 rebounds for the Spurs, who added this title to the ones they won in 1999, 2003, ’05 and ’07. They nearly had another last year, but couldn’t hold off the Heat. "I’ve said many times, a day didn’t go by where I didn’t think about Game 6," Spurs coach Gregg Popovich said of the turning point in last year’s finals. "So I think, just in general, for the group to have the fortitude that they showed to get back to this spot, I think speaks volumes about how they’re constituted and what kind of fiber they have." Not to mention tons of talent, and perhaps the best coaching in the game. "They played exquisite basketball this series and in particular these last three games and they are the better team. 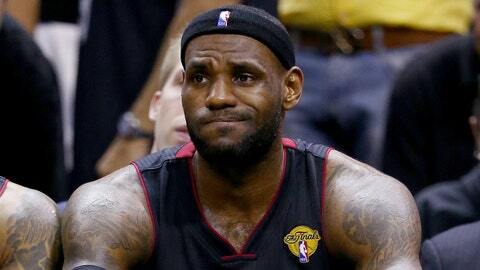 There’s no other way to say it," Heat coach Erik Spoelstra said. The Spurs won four titles in nine years, but hadn’t been back on top since 2007, making Foreigner’s "Feels Like the First Time" an appropriate song choice after the final buzzer. Duncan and Popovich have been here for all of them, and it was the fourth for Parker and Ginobili, who with Duncan are once again the reigning the Big Three in the NBA. Chris Bosh finished with 13 points and Dwyane Wade just 11 on 4-of-12 shooting for the Heat. The painful conclusion to last year’s NBA Finals served as the fuel for this one, powering the Spurs to a league-best 62-win season and a rematch with Miami — the first in the finals since Chicago beat Utah in 1997-98. Round 2 went to the Spurs, but both teams have challenges to navigate if there is to be a rubber match. San Antonio will face questions — as it has for years — about the age of its core, and whether Duncan, Ginobili and Popovich want to stick around. The Heat will brace for the potential free agency of James, Wade and Bosh, and will need younger, fresher pieces around the three All-Stars if they all stay. But this moment belongs to the Spurs. Playing a methodical, albeit winning, style for many years made San Antonio respected, but never beloved. The Spurs were TV ratings killers, casual viewers finding them not much fun to watch. But Popovich opened up the offense a few years ago, making the Spurs an easy-to-like, tough-to-beat group that thrives on ball movement and 3-point shooting. "You showed the world how beautiful this game is," Commissioner Adam Silver told the Spurs during the postgame award ceremony. A decade and a half after winning their first title in 1999, when Duncan was in his second season, the Spurs remain the NBA’s model organization, a small-market team that simply wins big and hardly ever does it with a high draft pick. Instead, they found players overseas or in other organizations who would fit the Spurs’ way of doing things and mesh with the Duncan, Parker and Ginobili, who have teamed for 117 postseason victories. That included Leonard, acquired in a draft-night trade with Indiana after playing at San Diego State, and Patty Mills, an Australian national who scored 17 points off the bench. 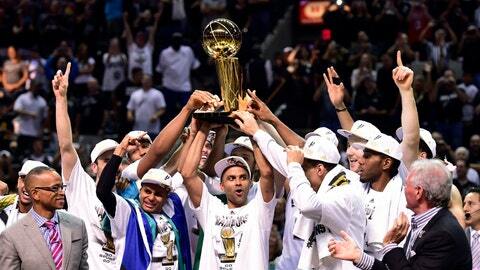 In the end, the Spurs made winning their fifth title look stunningly easy — much to the delight of the home crowd. After the slow start, they had their fans standing, chanting and dancing much of the second half. Notes: It was the Spurs’ 12th win by 15 or more points, most ever in a postseason. The Spurs outscored opponents by 214 points in the postseason. … Miami had won 11 straight series, tied for the fifth-longest streak in NBA history.